Quickly, it was a race to River Street to see the Lynx port! The crowds had gathered in anticipation of witnessing such a historic moment in Savannah. In the crowd, I identified several familiar faces: Megan Piper White and a few of the Visit Savannah crew, along with Allie Callaway and the Riverfront Association team. I knew the Lynx was built as a replica of a ship in the War of 1812, what I discovered was that the Lynx has embarked on a 5 year journey in celebration of the 200th Anniversary of the War of 1812 and the Star-Spangled Banner. The shipmates on the replica dress in Colonial clothing and entertain guests while educating them on the history of the war and ship, along with a detailed tour. 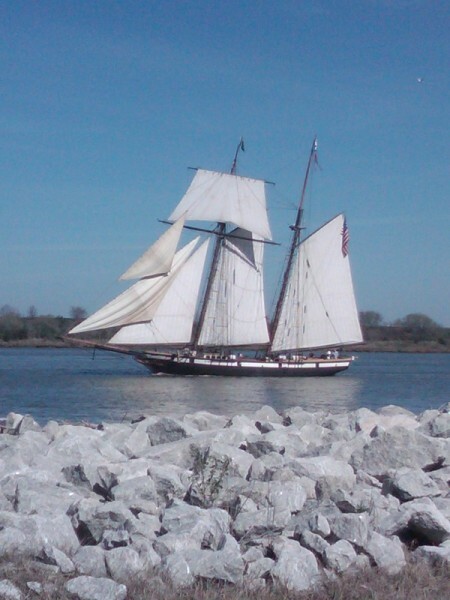 America’s Privateer is utilized as a museum and tours are available Tuesday – Saturday, through the month of March. As the ship arrived, the Lynx fired four cannons; which shocked many River Street travelers! 4 Mar ’11 Filed under Savannah Adventures. Bookmark the permalink. Post a comment. Leave a Trackback (URL).